Annie's always wanted a home and a family. But will pretending to be a bride get her closer to her dreams? All Annie Price has ever wanted is a place to call home. Growing up in the foster care system, that dream seemed far away, but now Annie's dream may be coming true. A friend she met in an online book group wants to retire and has offered Annie a fresh start managing her little bookstore. Believing the opportunity is an answer to prayer, Annie packs her suitcase and moves to Red Leaf, Wisconsin. The residents of Red Leaf welcome Annie into the fold...everyone except the bookstore owner's son, Jesse Kent. But Annie refuses to let the handsome deputy keep her from embracing her new home with open arms. She even volunteers to help the local historical society refurbish an old church and agrees to be the "bride" for a special reenactment celebrating the museum's open house. Jesse Kent can't believe his mother has handed the keys to her business over to a woman she met on the Internet. Annie's beautiful, of course, and smart as a whip, but what do they really know about her, anyway? What if she's come to their town just for his mother's money? The only way to see if his suspicions about Annie Price are true is to keep a close eye on her--even if it means he has to marry her! Planning their mock wedding will give him the chance to uncover Annie's motive for moving to town. But as the day of the wedding approaches and secrets come to light, Jesse must face the truth. He wants Annie to be his September bride...for real. 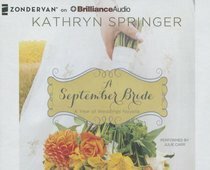 About "A September Bride (Unabridged, 2 CDS) (#10 in A Year Of Weddings Novella Series Audio)"
Carol Award winning author Kathryn Springer grew up in a small town in northern, Wisconsin. She credits her parents, who owned a weekly newspaper, for instilling in her a love for books--which eventually turned into a desire to tell stories of her own. Her "Love Inspired" debut novel, "Tested by Fire", was published in August of 2004. ýKathryn loves inspirational romance because she can combine her faith in God with her love for a happy ending! Order now to secure your copy when our stock arrives. Other edition is available. 9781511366298 0 Available. Expected to ship in 5 to 6 weeks from Australia.